‘Tis the season — for eating! There are just so many wonderful dishes this time of year, it’s hard to control my excitement! But in order to keep myself on track with my Weight Watchers diet plan, I try to do a lot of cooking at home. This year, I plan on using this amazingly yummy Weight Watchers Christmas Ham Recipe. It’s a cranberry-orange glazed glazed ham, that not only tastes amazing, looks beautiful and has just 5 Weight Watchers Points, but it’s incredibly easy to make and is a Weight Watchers Christmas recipe worth sharing. This is one of the best holiday recipes to make for a large party or dinner celebration because it’s so fast and easy and will look very impressive on your table. This Weight Watchers Holiday Recipe is sure to be a favorite with all of your friends and family! For glaze, in a small saucepan over low heat, stir together orange juice concentrate, cranberry sauce and brown sugar, whisking until smooth. Stick cloves into top of ham. 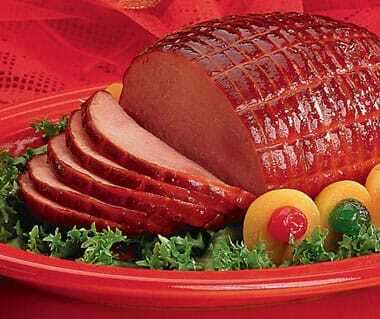 Place ham in a baking dish and brush with some of the glaze. Bake for 1 hour, brushing with glaze every 15 minutes. Slice thinly, garnish with orange wedges and serve. Hi Sara! Each serving is approximately a 4 ounce slice of ham. The entire recipe makes 8 servings, so just slice your ham into 8 equal slices. Hope that helps!